Last Updated: August 30, 2016 | Subscribe to our weekly newsletter! Depending on where you live, a heat pump may be an essential part of your pool’s system. After all, who doesn’t want to swim when it is cool outside. Your heat pump can warm your water extending your swimming season or they, at the very least, can help you take the chill off the water on those cooler spring or summer evenings. But like any machine, sometimes you run into problems. There is nothing worse than jumping into a pool that is cold when it should be warm. If your heat pump is acting up and not heating your water the way it should, then there are a several things you can do to check the problem and perhaps even fix it yourself. Let’s take a look at some of the most common problems you will encounter so you can troubleshoot a heat pump yourself. Now, let’s get started and look at some of the most common problems you may see with your heat pump that will stop its heating power in its tracks. This is the number one problem owners encounter with their heat pumps. If your heat pump isn’t working as it should, double check to be sure you have good water flow. Double check all the valves to make sure they are open and then check to see if your filter is clogged or dirty. Sometimes a dirty filter can be the source of your heat issues. Is your heat pump getting power? If it isn’t, then check to make sure the breaker hasn’t been tripped. There could be a wiring issue or a bad connection. Please use caution when dealing with electricity. If you aren’t sure what you are doing, call in a licensed electrician to take a look at your wiring. Your heat pump needs air in order to heat your water, but if your evaporator coil becomes clogged with debris the air flow will be too low to provide the right amount of heat for your water. Check the coil and remove any leaves, dirt, sticks and twigs that get clogged in there potentially blocking the air from flowing properly. Do you have the thermostat set to the right temperature? Remember, it needs to be set higher than the actual temperature of your water. Get a thermometer and check your water to see if you have the settings correct. In some cases, you could just have a bad thermostat that will need replacing in order to get the heat pump back into working order. Believe it or not, there are limits to your heat pump. When the air reaches about 50 degrees Fahrenheit outside, the refrigerant inside the unit is already approaching freezing temperatures. When this happens, ice can form clogging up your heat pump and preventing it from running. If you notice ice forming on your heat pump or it doesn’t seem to be heating properly, check the temperatures outside around the unit. While you could also have a refrigerant leak, you could just be operating it when it is too cold outside. Your heat pump could be giving you a freon pressure error. When you get one of these pressure errors, you need to check if you are getting a low pressure or a high pressure error. If your freon pressure is low, chances are it is too cold outside to operate your heat pump. In this case, you are going to have to wait for the weather to cooperate before you try to use your heat pump. If the pressure is too high, you probably have a water flow issue. In this case there is not enough water flowing through the system to remove the heat. Check your filters and look for any clogs in the lines to improve the flow of water. Sometimes, you may see water in and around your heat pump. While you may think this is a leak, it could just be condensation forming and then dripping from the unit. Using a chlorine test strip, test the water you find around your heat pump. If you get a reaction, you know you have a leak as it is pool water. If you get no reaction on the test, you know it is simply condensation. When condensation forms in and around your heat pump, you probably have a clogged drain. Most pumps move the excess water produced to a drain so it doesn’t form in and around the unit itself. If these lines are clogged, then the condensation will back up into the system and you will have what appears to be a leak. Clean out the drains and any lines leading to the drains to see if that takes care of your condensation problem. Sometimes, the problems with your heat pump may require a professional to solve. Make no mistake, we believe in fixing things ourselves here at Swim University, but sometimes the problem is outside your range of fix-it skills, and that’s okay. If you need a little assistance with your repair or just aren’t sure what is going on, don’t be afraid to call a professional. They will help you find the problem straight away so you can start heating your water and enjoying your pool even on those cool nights. Frustrated by adding chemicals and trying to keep your pool clear all the time? We cut out all the fluff and confusion of pool maintenance and stripped it down to the bare bones in this easy-to-read illustrated ebook and video course. There is nothing quite like swimming on those cool nights in the spring or fall, and our pool’s heat pumps allow us to do just that. However, like anything mechanical in nature, sometimes there will be problems with our heat pumps. Knowing some of the most common causes of heat pump problems and what you can do to fix them is a great way to keep your heat pump running when you need it and you can save a ton of money if you fix it yourself. So put on your tool belt and start checking your heat pump today, so you can enjoy an extra long swimming season this year. 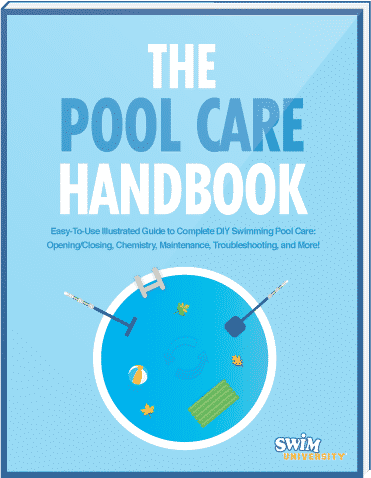 We cut out all the confusion of pool maintenance in this easy-to-read illustrated ebook and video course. It'll help you save $100 right away on pool care! Keep your pool warm and your wallet full. A solar pool cover used the right way can help you save on chemicals, utilities, and water. Find out how. Find out how to troubleshoot your gas pool heater so you can fix some of the most common problems yourself without having to call in a professional. Why settle for dipping a toe in to see how cold the water is? Get a reliable pool thermometer, and always know what you're diving into. Is your pool too hot to swim in? There are ways to cool it down along with our online calculator to find out exactly how much ice it would take, LOL. What is The Perfect Swimming Pool Temperature? Varying degrees of pool water temperatures can have major effects on your body. Find out what the perfect swimming pool temperature is. Why do you want to buy the best pool heater? Whatever the reason, this is the right guide to buying the perfect pool heater for your swimming pool.